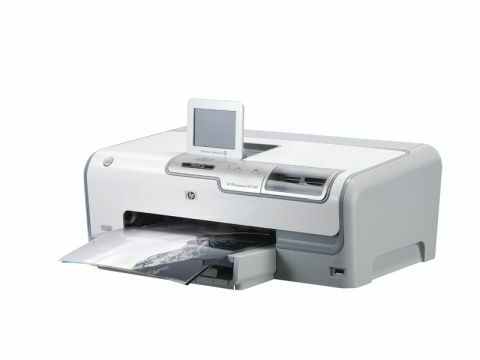 Halfway between a bare-bones printer and a multifunction device, the D7260 includes multi-format card readers and a 3.5-inch colour LCD touch-screen for direct photo printing, but it lacks a built-in scanner. Considering its wide-ranging features, the printer is aggressively priced and running costs are also very reasonable, based on a line-up of pigment black ink and dye-based cyan, magenta, yellow, light cyan and light magenta inks. Unlike many of HP's old-school models, the cartridges are all individually replaceable, like all the other printers on test. As with the Epson PX800FW, A4 plain paper has to make way for facedown photo paper in the bottom tray, but at least there's a secondary specialist tray for 6x4-inch photo paper. Another letdown is that, true to form for HP, you can only access the top quality, maximum resolution-printing mode when printing from an attached computer, and not when printing from PictBridge or a memory card. Print quality is very good on the whole, demonstrating a major step forward for HP compared with some of its older photo printers. Our only slight reservations are that darker skin tones can sometimes look a little bit muddy, and the deepest blacks of mono photo prints have a slightly blue-black tinge.